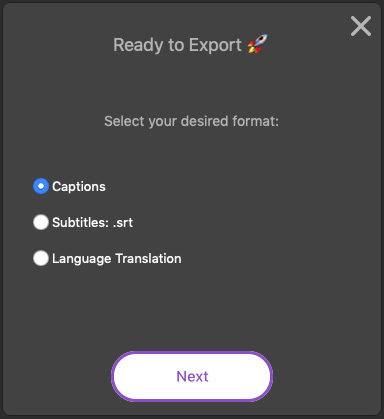 Shamir Allibhai, CEO of Simon Says, reminded me they recently released a workflow extension for Apple Final Cut Pro X that provides automatic speech-to-text transcription. 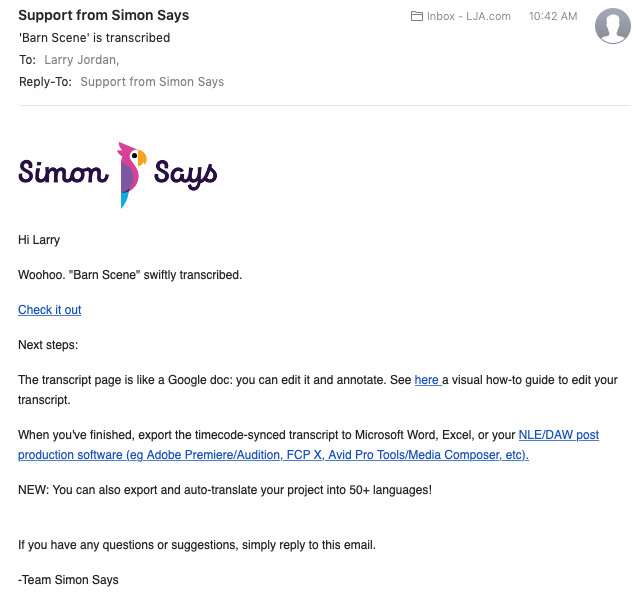 In fact, Apple announced at a recent LACPUG meeting that the latest version of Simon Says can automatically translate into 50 languages, which speeds distributing your projects around the world. Simon Says started as a website to automatically transcribe media files. That remains the best place to go to transcribe, edit and export files with the greatest flexibility. 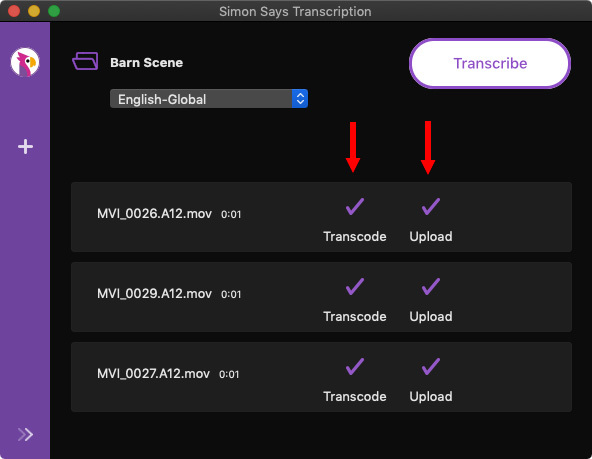 However, late last year, Simon Says released a free workflow extension that tightly integrates automatic transcription within FCP X. The good news is that this allows easy access to most of the power of Simon Says. The problem is that FCP X doesn’t display transcript text in a way that makes it easy to read or edit. This extension is a solid effort by Simon Says, limited by Final Cut Pro X. I expect both to improve over time. The initial installation provides 15 minutes of free transcription as a trial. The program is easily installed from the Mac App Store. After installation, you need to create an account, then confirm your email address via email. 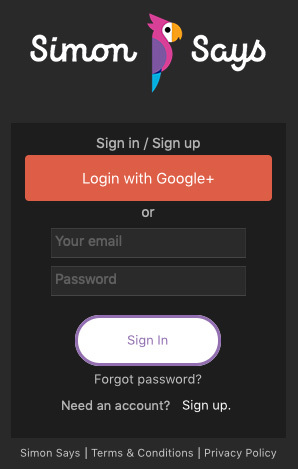 Log-in with the credentials you created when you installed the app from the Mac App Store. Next, create a new project. Once the project is created, drag either clips, events or projects into the Drag and Drop box. For this example, I dragged in a project, containing a rough cut of dialog from a dramatic scene. Since you are paying per source media minute, it is a good idea to think carefully about how to organize the clips you want to transcribe in FCP X before beginning the transcription process. Dragging in Events is the easiest way to use the interface, but you’d only want clips with audio you need transcribed stored in that Event. NOTE: If English isn’t your native language, you have MANY other languages to choose from! (This screen shot is only a partial list…) The Simon Says website says they support 90 languages. NOTE: Since transcription quality improves when there is no background noise, sound effects or music, if you plan to transcribe a project, do so before adding any additional audio elements. Before transcription starts, it displays this message so you know how much you are spending before you commit to the transcript. NOTE: I’m using the free 15 minutes in the trial version here, which is why there’s no charge. Click OK and the transcription process begins. This screen appears when the transcription is complete. The process didn’t take long, however, the precise time will vary depending upon the size of your files, the speed of your Internet connection and the quality of the audio files. In general, though, it should be roughly equal to or faster than real time. I selected Captions. Transcripts are synced to source media timecode. 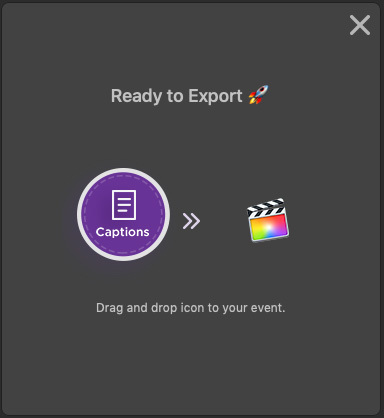 Drag the purple icon back into FCP X. Because I sent a project, I dragged this icon back into the same folder as the original project. Simon Says recommends creating a second project, rather than replace the existing project. There’s a dialog that makes this simple. Here you see the new project, with captions attached, next to the original project. NOTE: Simon Says recommends exporting projects as master files then sending those as single clips to be transcribed. However, as we see here, it is possible to send entire projects themselves. The benefit to exporting a project is that you are able to boost and adjust audio levels, which improves transcription quality, as we’ll see next. So, not perfect. But fast and, since captions can be edited, straight-forward to correct. NOTE: I suspect that the missing dialog at the beginning was caused by audio levels that were too low; which is a good reason to export the project before transcribing. Let’s try another example. I created an event containing two interview clips. I transcribed them following the process outlined above. When the transcript was complete, I clicked “View Transcript.” This took me to the Simon Says website, but there was no indicator of what I needed to do to view the transcripts. This button is less helpful than I expected and, if you wait too long, the button itself disappears. NOTE: This dialog needs to be improved. You need to log on to the Simon Says website to edit a transcript, which is not stated anywhere. You use the same login for the website that you use for the Extension. It is also unclear, if you edit the transcript on the Simon Says website, whether that edited version is the one that is exported. When transcription is complete, Simon Says sends you an email. This is really helpful for bigger projects which can take longer to transcribe. The email contains a link allowing you to view and edit the transcript. 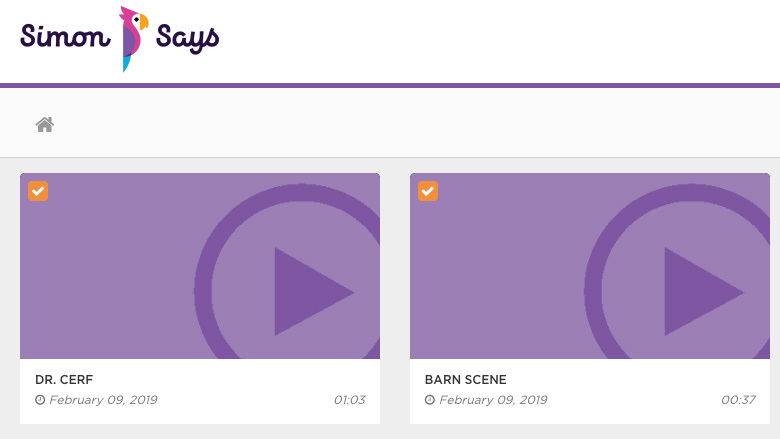 Unlike SpeedScriber from Digital Heaven, Simon Says only allows you to hear the audio as you review a transcript, rather than see the video as well. NOTE: For users who request the ability to do video proxies, Simon Says provides a build to do so. They are updating their roadmap plans soon so it will be clear that this feature is there for those with a subscription membership. Let’s go to the website to edit the transcript, as it is almost impossible to edit in Final Cut. Once you log in, all your current and past transcripts are displayed for review. Double-click the one you want to review. NOTE: For some, posting media to the web and leaving it accessible raises security issues. Simon Says also offers a totally in-house automated transcription service, which may be of interest to those with extreme security concerns. Here’s a link for more information. Here’s the transcript. It’s about 90% accurate. Notice that it caught the two different speakers at the beginning, but not the end. Unlike Projects, when clips are dragged back into an Event, the transcript is added as a note. This makes the clips searchable, because Final Cut’s Find utility searches the Notes field. But it is REALLY difficult to read or edit the transcript. NOTE: Simon Says has on their roadmap the ability to export to ranges where the notes are sentence by sentence (right now it is row by row) to make it more legible. 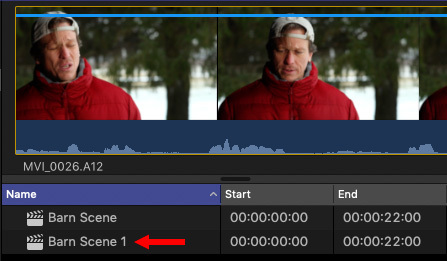 Clearly, for FCP X to work more easily with transcripts, the Notes field needs to be resizeable, much more easy to edit and allow us to jump to a point in the clip when we click on a word in the transcript. 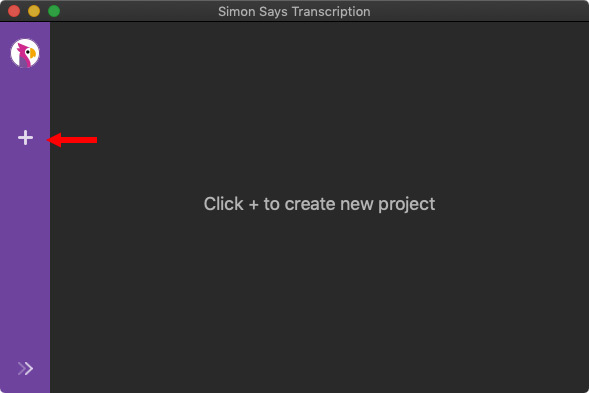 NOTE: Simon Says recommends that, while you create duplicate versions of projects, you replace non-transcribed clips with those that have transcripts. Again, there’s a dialog that appears as you drag the clips that makes this easy. NOTE: I also discovered that text in the Notes field is displayed in the Browser, but does not show up reliably in the Notes field in the Inspector. As well, it is difficult to select and copy the text of the Notes field. All of these are Apple issues. Subscriptions can be paid either monthly or annually and all plans can be canceled at any time. Publishing podcasts with translated transcripts for global audiences. Because translations are machine-generated, it is possible for errors to exist. Since I can only speak English, I didn’t test this feature. Additionally, recordings that have lots of jargon, acronyms or specialized language will require more editing after the transcript is generated to improve accuracy. As a note to the team at Simon Says, it would help a lot if you could make your tutorials easier to find on your website. Like I said earlier, automated transcripts are faster and cheaper than a transcription service, but they are not perfect. There’s no free lunch. Over the last few months, I’ve become much more of a fan of automated transcripts for planning an edit. While nothing beats the quality of a good transcriptionist, for rough cuts close is often good enough. In fact, we will be working with Simon Says at the 2019 NAB Show to provide full transcripts of the Digital Production Buzz podcasts live from the trade show floor. I enjoy working with Shamir and his team. 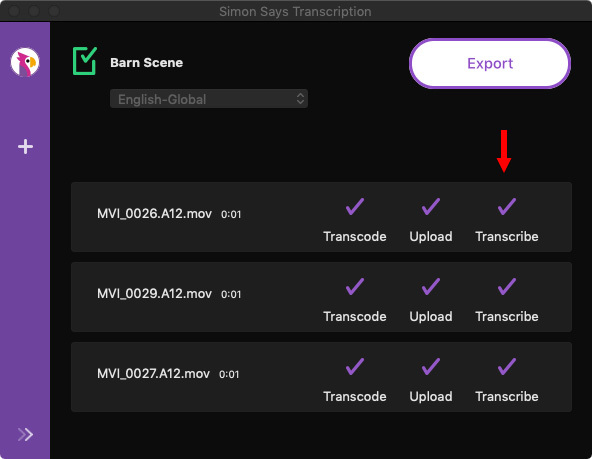 Until FCP X improves its ability to link, display and edit transcripts, you would be better off to submit clips using the SimonSays website, where you can transcribe and edit clips much more easily. The cost is the same, either way. The Simon Says workflow extension for FCP X is a solid first step, limited by the ability of Final Cut Pro X to display transcripts associated with clips or projects. Simon Says has updated it multiple times since its release, with a clear roadmap detailed on their website. Now, we just need to wait for Apple to catch up. Hi Larry. I’m always puzzled by the announced pricing for transcription services. 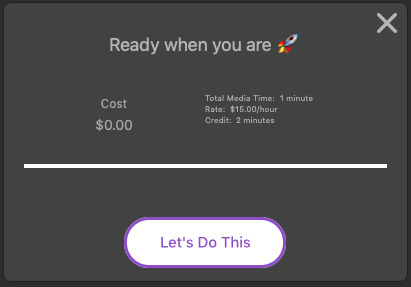 Is the pricing based on media time, or processing/administrative time? It’s never clear to me.